Experience the most delicious and beautiful food and wine regions of France on this ultimate 11-day all-inclusive vacation, the ideal food lover’s French road trip. Experience with all of your senses Provence, Lyon, the Northern Rhone Valley, Burgundy, some of the most beautiful villages in the world, and then sip Champagne in its homeland surrounded by the lush, rolling vineyards. On this foodie French road trip, you’ll stay in deluxe boutique hotels in the Provence countryside (3 nights), Lyon (2 nights), Beaune in Burgundy (3 nights), and the Champagne countryside (2 nights). This is a dream vacation that perfectly blends the very best food, wine, picturesque villages and classic sights for a wonderful journey. Enjoy a variety of activities, winery visits, food and market tours, cooking classes, scenery and cultural walks. The food and wine will be amazing and varied as we move through each French region. The vacation includes two full-meal cooking classes, three food and market tours, five winery visits and tastings. As with all Food Lover’s Odyssey vacations, Chef Kathy has personally selected all experiences and dining venues, making sure your meals and activities are authentic and delicious. This is an exclusive vacation only for private groups of 2 – 8 people. This vacation can easily be modified and tailored specifically for your private group’s travel preferences. Want to include more wine-tasting experiences and less cooking classes? We can do that. Want to include more cultural and historic sights and less wine or food experiences? We can do that, too. Want to replace any portion of the vacation with two or three days in the Alsace region? We can do that, too. This is your group’s tailor made French road trip. We can customize it to make it exactly as you’ve dreamed it to be. Starting at $4,990 per person (based upon double occupancy) for private groups of 4 – 8 people. *This vacation is also available for a group of 2 people. Please contact us for pricing. Any dates from April through October, depending upon availability. Kathy will work with you to determine your detailed itinerary and pricing. You will confirm your group’s vacation itinerary and number of people at time of booking. A non-refundable deposit of $1,250 per person is required at time of booking. The remaining balance is due 90 days prior to your vacation start date. You can make payments by credit card, bank transfer, or check. 11-days/10-nights’ accommodations at deluxe boutique hotels in Provence (3 nights), Lyon (2 nights), Beaune/Burgundy region (3 nights), Reims/Champagne Region (2 nights). First-class, high-speed train travel from Paris to Avignon at the beginning of your vacation. Private transfers and all transportation during the entire vacation. This is a sample itinerary based upon the vacation outlined above. Exact Itinerary will be decided by you and confirmed at time of booking. Kathy will meet you at the Paris Charles de Gaulle airport and you will take the high-speed TGV from the airport to Avignon. Your first-class ticket is included in the vacation package. You will check into your hotel in Provence and have time to relax and get settled in. In the evening, we will take an orientation walk through Avignon, learning a little about its history and seeing the exterior of the Palace of the Popes, visiting the St. Benoit Bridge. Enjoy a welcome dinner in Avignon with wines from the surrounding Southern Rhone area. After breakfast at the hotel, your day will focus on exploring the gorgeous villages of the Luberon valley, their beauty immortalized in words by many writers, most recently Peter Mayle. Tour one of the beautiful markets of Provence (market will depend on the day we visit). Visit the ochre-covered hills of Roussillon. In Roussillon, you’ll have time to explore the town on your own, take photos and/or shop in the village’s many cute little shops. We’ll have lunch together at a beautiful spot in the countryside of Menerbes. The late afternoon will be yours to enjoy on your own. Kathy will give you suggestions for dinner and exploring on your own. After breakfast at the hotel, explore the village of Chateauneuf du Pape. Our day will start at the top of the village at the ruins of the “new castle” of the pope. Learn about the history of the town and its wine before visiting a winery and tasting. Lunch will be at Kathy’s favorite restaurant in the village where you will pair your three-course meal with the village’s and the area’s wines. Afterwards, you will have the option to visit the Pont du Gard on our way back to your hotel. In the evening, you are free to relax. Choose to relax by the pool or go into town for an evening stroll. This morning after breakfast in Provence, you will leave the region and head north to the city of Lyon. On your way to Lyon, visit one of the Northern Rhone valley’s gorgeous wine-making villages. We’ll stop at a winery for a tour and tasting. Experience how the terroir changes the Syrah. We’ll have a light lunch before making our way to Lyon and our hotel in the city. After time to check into your hotel and relax, we’ll meet in the early evening for an orientation walk through the city and dinner at a traditional bouchon Lyonnais. After breakfast at the hotel, we’ll take a food and market tour in the historic center of Lyon. Lunch will be the food we taste on the tour. You will have the rest of the day free to enjoy and explore Lyon on your own. After breakfast, we will leave Lyon and head farther north to the city of Beaune, Burgundy’s wine capital city. We’ll have lunch together on our way before checking into our hotel. In the afternoon, we will take a walking tour of the city that will end with a Burgundian wine tasting and dinner together at a favorite restaurant. 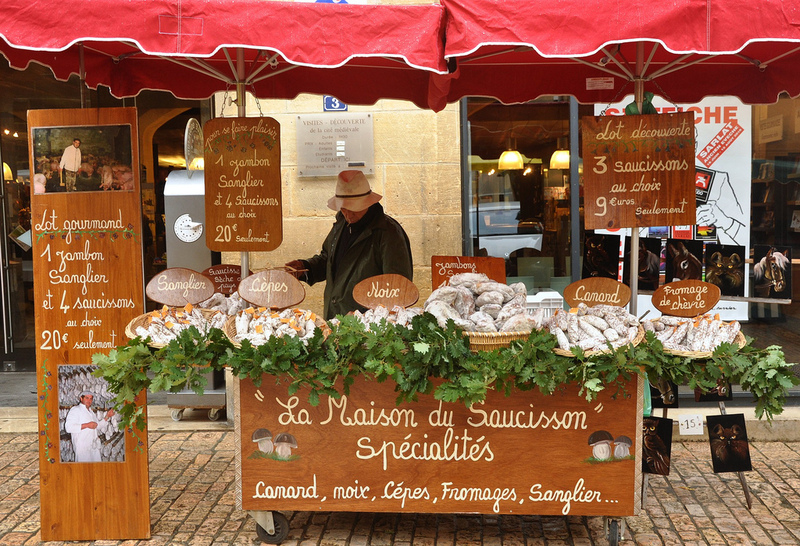 Making sure to arrange your vacation so that we are in Beaune on a Saturday, we’ll head to the village’s famous Saturday market for a tour. After our market tour, we’ll enjoy a Burgundian cooking class with a local chef. The afternoon and evening are yours to enjoy as you like. Today is all about the magnificent wines of the region and some the most beautiful villages in all of France. Kathy will put together a dream day in Burgundy based on your groups’ travel preferences. Choose to have a wine-paired lunch at a winery or with a view of Vezelay. Tonight we’ll have dinner together in Beaune. After breakfast, we will leave our hotel in Beaune and travel towards the Champagne region. On our way, we will stop for lunch in the Champagne region for lunch and a champagne tasting. This afternoon we’ll check into our hotel and then enjoy a later afternoon historical walk in Reims, visiting the historic city center and the city’s cathedral. You’ll have the rest of the evening free to dine on your own in the city. Choose one of Kathy’s recommendations or a casual spot with a view. After breakfast, we will visit the town of Epernay. Walk down the Avenue of Champagne and learn the history of France’s famous sparkling wine. We’ll taste more champagne today during our walking tour. You’ll have the afternoon to enjoy lunch and explore more on your own. This evening we’ll have a special French Road Trip farewell dinner together. After breakfast, we will say au revoir and your private transfer will take you to the Paris Charles de Gaulle Airport or the 45-minute high-speed train to Paris, if you are choosing to extend your stay in Paris.